PRP, or Platelet-Rich Plasma, is a gel derived from the plasma in your blood that is rich in blood components called platelets. Also called the “PRP Facial” because of its derivation from blood, PRP is injected into the skin at target sites like the corners of the eyes and mouth to help smooth out fine lines and wrinkles, just like a synthetic facial filler. What makes the PRP Facial different from an ordinary facial filler is that platelets are a component of blood that naturally stimulates growth and tissue regeneration. In the blood, platelets flock to wound sites to promote clotting and tissue regrowth; in PRP, those same platelets are combined with growth factors to promote tissue growth and elasticity in areas that are particularly affected by aging. Small quantities of your own blood are centrifuged to separate out the red blood cells, the white blood cells, the platelets and the plasma; the platelets are then reintroduced to the plasma to create a gel that not only acts as a filler, but that helps aging skin repair itself from within to eliminate frown lines and crows’ feet. Almost anyone who wants a natural and non-invasive solution for aging skin are candidates for PRP. Because the platelets are derived from your own blood, there is very little risk of reaction, and the actual process of injecting the Platelet-Rich Plasma is even less invasive than Botox. 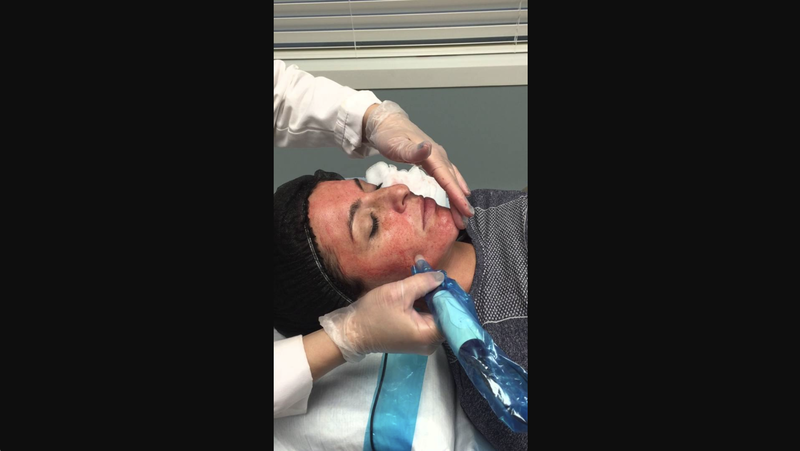 PRP is particularly good for younger patients who want to get a head start on rejuvenating their skin with a solution that will look natural and youthful – in fact, Kim Kardashian went viral with her Instagram posts on her own Vampire Facial. PRP also isn’t just for facial treatments: men or women who are experiencing hair loss can get PRP therapy in the scalp to stimulate follicles and promote hair regrowth. Dr. Wise recommends to have three treatments spaced one to two months apart to get the most out of your PRP Therapy; after this, the positive benefits of PRP therapy can last for a year or more. Why Choose The Wise Center For Your PRP Rejuvenation? Not all PRP is created equally – the Wise Center is the only office in New Jersey to utilize the Magellan Tru PRP System, which delivers the highest purity, hospital grade PRP for optimal results. Using the Magellan system, Dr. Wise is able to provide PRP that is 8x purer than PRP you could get elsewhere. Using a Rejuvapen, the PRP is delivered to the deep layers of the skin through micro-channels created by a Fractional Dermabrasion process. In addition, Dr. Wise injects the PRP into areas of concern similar to the way a filler would be injected. Any procedure comes with risks, but Platelet-Rich Plasma Therapy is one of the safest and least invasive ways of achieving a natural-looking facelift. Complication with facelifts and fillers are usually because your body reacts to foreign substances, which can cause swelling and discomfort; but with PRP, the plasma that is injected is derived from your own blood. The body can’t react to it as a foreign substance, because markers in the platelets tell your body that the plasma is safe and familiar. This makes PRP a particularly attractive option if you have previously experienced side effects with other facial fillers. Of course, there are still things that can make someone more likely to experience adverse effects from PRP. If you have a clotting disorder, certain blood-borne conditions or particularly sensitive skin, you may not be a good candidate for PRP. Schedule a consultation with Dr. Wise to find out if PRP is the right choice for your facial rejuvenation.